We do the hard work of integrating data from a broad array of public sources and databases so you don't have to. The algorithms in Plex Professional highlight connections and display results with the most connections. Plex Enterprise allows organizations to make the most use of their internal scientific data by connecting the public data available in Plex Basic with their own, proprietary data. Universal Data Search: Plex not only makes your data accessible, searchable, but also shows scientists how their data is connected to the broader scientific knowledge-base (both public and private) using the same algorithms that power Plex Professional. Universal Algorithm Search: Plex Enterprise can also incorporate the results from internal algorithms (e.g. target prediction algorithms) into the Plex Search results. This allows scientists to seamlessly link algorithm results to other research findings. Security: Scientific data is uploaded into a private, secure AWS instance, and easily managed by any bioinformatics or IT professional. Plex Search is fully transparent providing all of the evidence for a search results with direct links to the source material. Individual lines of evidence start with those that are most direct and contain the most data, making it easy for scientists to validate existing hypotheses or to form new ones. Plex is chemistry aware. You can draw chemical structures, paste in SMILES strings, InChIs, InChIKeys, even for entirely novel compounds. 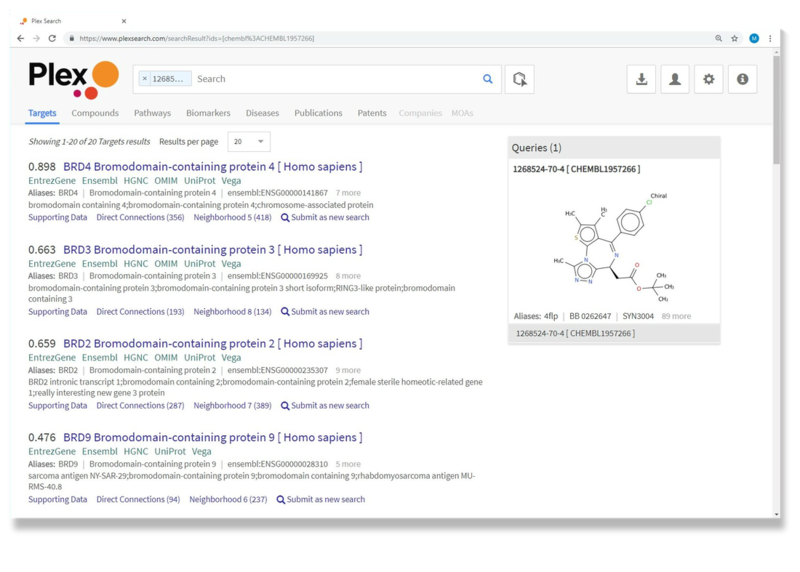 The built in chemical similarity engine automatically maps your compound to other similar compounds and continues the search from there. This makes your search more expansive and allowing you to search all similar chemical space without even knowing it. Your search isn't limited to just your molecule. You can find out what is known about a molecule even before it is synthesized. Our search model is truly universal, so although we’re initially focused on life sciences data, really ANY kind of data can be made searchable. We can also include AI-powered or other algorithms as part of the search - as long as they’re performant and as long as they have an API – they can be included. So Plex can be the glue that brings the entire organizations’ data and algorithms together. So while other search engines are limited to web pages and documents, Plex can search data in all its many forms – whether it’s relational databases, NoSQL, flat file formats, and even directly from algorithms themselves. 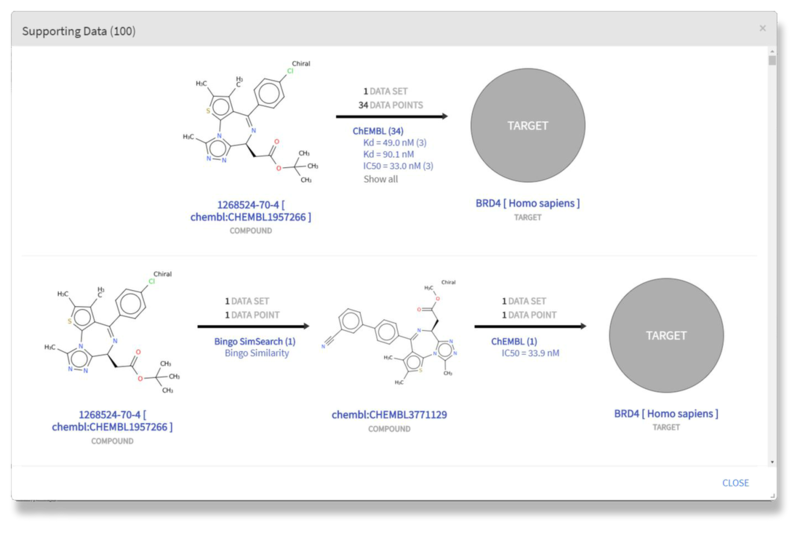 Plex Search comes with one of the most sophisticated molecular similarity algorithms built in. This 2D molecular similarity algorithm runs in every search in real-time and automatically connects molecules in a similar space to targets, diseases, pathways, publications and patents. This allows scientists to search new chemical material and to discover previously unknown connections. ANY kind of data can be made searchable. We can also include AI-powered or other algorithms as part of the search - as long as they’re performant and as long as they have an API – they can be included.